Sand City California is blessed with an abundance of, well, sand, including the highest dunes found along the state’s Central Coast. But this isn’t your garden-variety beach sand. We’re referring to spectacular dunes formed during the Pleistocene era at the tail end of the last ice age somewhere in the neighborhood of 6,000 to 15,000 years ago. Sand City Beach is also known for its strong winds, making even the summer months a tad chilly at times. With about a mile and a half of ocean, Sand City is virtually surrounded by much larger cities, like Seaside. Look above the dunes, and you’ll see a sky full of para gliders. The same steady winds that lure hang gliders to Marina State Beach draw para gliders to its sister beach a little south. Sand City is one of the prime spots in the state for paragliding. The winds are perfect, the launch area ideal — and the view is incredible. 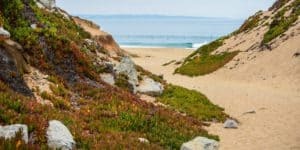 The Monterey Bay Coastal Recreation Trail runs right through the sand dunes, north to Castroville and south all the way to Pebble Beach. For a list of all the area beaches << Click Here >>. The best time to visit Sand City is between April and May. Spring offers warmer temperatures, fewer crowds and food festivals dishing out delectable eats, including Pebble Beach Food & Wine and the Artichoke Festival in Castroville. Summer is the most popular time to visit the Sand City. Located right on the ocean, the region experiences bitter winds, so bring a sweater regardless of the season. Fall is another good time to visit, but the likelihood of rain increases starting in October. Sand City’s central California location subjects it to mild temperatures during the winter, with the average low reaching 48 degrees. Winter also brings lower hotel prices and the celebrity-heavy AT&T Pebble Beach Pro-Am event held in February, making Sand City an attractive destination year-round. The small city of Sand City, California is completely wrapped around by the city of Seaside. Once an industrial area along the shoreline, Sand City Beach is going through changes. 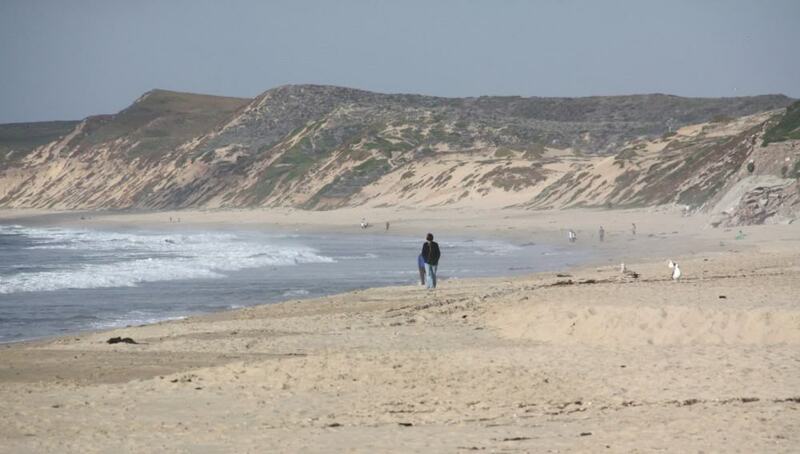 The entire dunes structure west of Highway 1 is being protected from development. Much of this land has already been designated as Eolian Dunes Preserve. 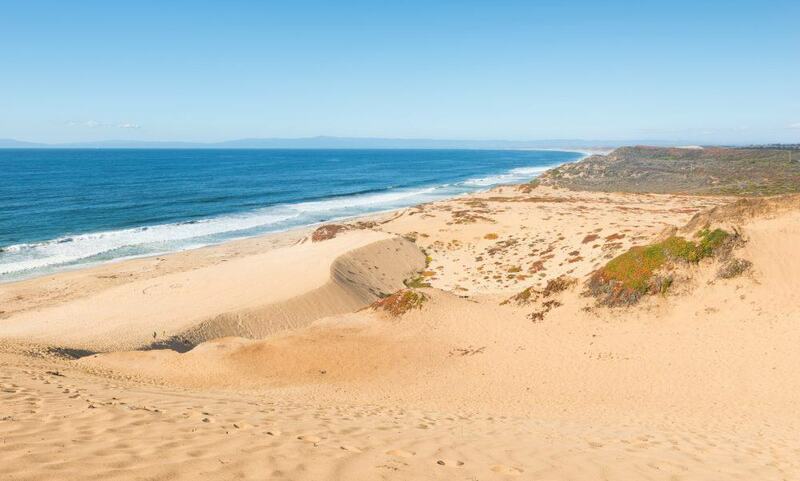 The paved Monterey Bay Coastal Trail runs through the dunes providing access to trails that lead to Sand City Beach. The trails in the preserve are open to hiking, biking, and leashed pets, but don’t trample the vegetation next to the trails. “The Crater” and its adjacent beach are best-known as a clothing-optional area, but should be known for the sandy playground that they comprise. The Crater is a huge depression in the dunes that has sand rising up around it on all sides. Some slopes are gentle while others are downright steep. Kids and adults can find a comfortable grade to climb and jump off of or slide down. The beach here is wide, sandy and feels remote. Bike, kayak, paddle board and family bike rentals and tours are our specialty. They are located right in the action of Cannery Row and welcome all ability levels. Kayaking is with the otters, seal lions and seals and includes all equipment. Biking is out to 17-mile drive in Pebble Beach. 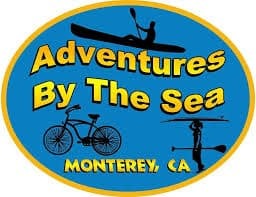 For more information call (831) 372-1807, or visit them on the web at Adventures By The Sea. 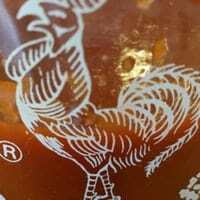 The Stagnaro family has been serving the Monterey Bay and Santa Cruz area for over a century since Italian Patriarch Cottardo Stagnaro settled in Santa Cruz in 1879. They have provided Ocean Adventures to thousands of people each year, and now offering the best Monterey Bay whale watching on our luxurious charter boat, Velocity. For more information call (831) 427-0230, or visit them on the web at Santa Cruz Whale Watching. At Whisper Charters, they provide eco-friendly nature tours of the Elkhorn Slough aboard their silent, zero-emission powered boat. Their knowledgeable captains will help interpret the natural and human history of this beautiful marine reserve. See rare southern sea otters, shy harbor seals and hundreds of resident and migratory birds in a comfortable and elegant vessel. For more information call (831) 207-6305, or visit them on the web at Whisper Charters. Elkhorn Slough Safari ™ is an exciting way to visit Elkhorn Slough! You will see a fantastic variety of wildlife such as playful sea otters, curious harbor seals, sea lions, hundreds of species of birds and so much more. The tour will provide excellent opportunities to view and photograph wildlife close at hand. These boat cruises include an in-depth look at various aspects of slough ecology, fascinating history, and birding in the company of a naturalist guide. 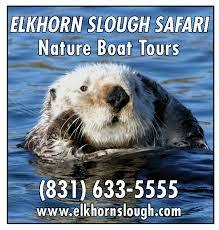 For more information call (831) 633-5555, or visit them on the web at Elkhorn Slough Safari Nature Tours. Wild Fish offers only the finest organic provisions, purchased directly from local purveyors with exclusive plates crafted by our premier chef. From the headland where we sit, there’s a view of waves combing the crags of Little River Cove, with a stunning sunset beyond. Where delectable fresh dishes meet a wistful atmosphere, Wild Fish makes every meal a spectacular dining experience. For more information call (831) 373-8523, or visit them on the web at Wild Fish. Chart House is a fine dining restaurant serving seafood & steak and famous for their spectacular views. Chart House restaurants specialize in dazzling views, unique cuisine and exceptional service. From fresh fish specialties to slow-roasted prime rib, the renowned chefs of Chart House have tailored a menu that adds a unique touch to local flavors. And the Chart House happy hour is a guest favorite, where guest favor our signature cocktails and delicious bites you are sure to enjoy. For more information call (831) 372-3362, or visit them on the web at Chart House. Montrio is an upscale “Bistro” offering a diverse menu rich in local ingredients. Wood fired grill and brick oven are used in many of the dishes. Montrio features: Prime Steaks, Natural Pork, Seasonally Local Seafood, Free Range Chicken and the Best in Local Produce. For more information call (831) 648-8880, or visit them on the web at Montrio Bistro. Passionfish offers serious food in a fun and causal atmosphere. The combination of Chef Ted Walter’s uniquely flavorful culinary creations and an award winning wine list have earned Passionfish a place among California’s finest restaurants. Passionfish’s ever-changing menu makes each visit a new adventure. Although the name Passionfish naturally conjures up visions of fresh seafood, the menu also offers many tantalizing alternatives, including steaks, fowl, and vegetarian dishes. And the wine flows freely at Passionfish, from a list as diverse as any in the world. For more information call (831) 655-3311, or visit them on the web at Passionfish. A coastal and southern Mediterranean cuisine. Their menu consists of many small plates and changes almost daily with focus on local and organic ingredients. Their diverse wine list designed by the owner Sommelier offers high quality wines from our local Monterey County appellation and from around the world. For more information call (831) 920-2662, or visit them on the web at Jeninni Kitchen & Wine Bar. They offer a wide range of Craft Beer, and Ciders from all over the world. With 17 rotating taps, and over 300 bottles for consumption on or off premise. 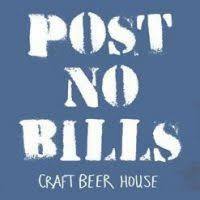 For more information call (831) 324-4667, or visit them on the web at Post No Bills Craft Beer House. A locals bar with three dart boards, pool table, and live music on Thursdays. Wednesday night hosts Monterey Bay Dart League matches. Tuesdays there pool and/or dart tournaments. For more information call (831) 394-2666, or visit them on the web at Cuz’s Sportsman’s Club. Carbones is a great bar, reminiscent of cheers. Sal the owner is friendly and kind and if you are new and or by yourself he will make you feel welcome and introduce you to other friendly customers/regulars. There is a nice fire pit outside. Dart boards inside and outside, pool table and Foosball table. Wednesday nights they have a luck of the draw darts tournament and good fun people participate. For more information call (831) 643-9169, or visit them on the web at Carbone’s. The Sand Castle Inn is located minutes away from the ocean and the heart of Monterey. With their newly remodeled 34 rooms, they offer amenities such as microwaves, refrigerators, cable, free wi-fi, irons, and hairdryers in each room, along with a continental breakfast. They provide parking and a guest laundry. The Sand Castle Inn is just 3 miles from the famous Fisherman’s Wharf, Cannery Row, and the Monterey Bay Aquarium. For more information, pricing, or to reserve your room, visit Sand Castle Inn. 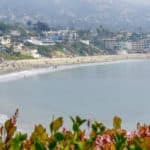 For unwinding and fine dining, relaxing and rejuvenating, sandcastles and sunset cocktails, your favorite California escape awaits at this beachy chic boutique hotel. Perched directly on the beachfront in Monterey, their glass-enclosed lobby instantly treats guests to intoxicating bay and ocean views. Feed your culinary cravings at on-site eateries Bar Sebastián and Vizcaino Waterfront Food + Drink, which both offer delicious cuisine and dramatic ocean scenes. Take a sip, a moment, a bite, a breath, and listen to the waves crashing at your feet. For more information, pricing, or to reserve your room, visit Monterey Tides, a Joie de Vivre Hotel. This property is a 5-minute walk from the beach. Located off Highway 1, this Seaside, California hotel features an outdoor pool and offers rooms with free Wi-Fi and a flat-screen TV. 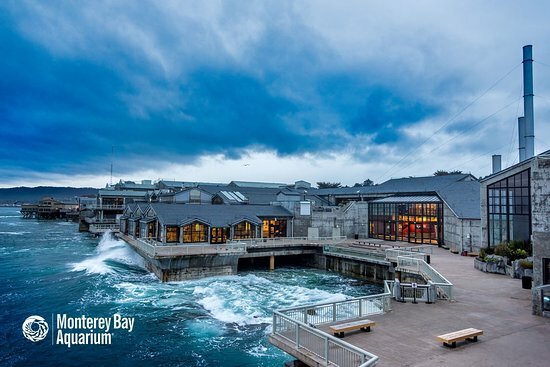 The Monterey Bay Aquarium is just a 10-minute drive away. A work desk and coffee maker are provided in all rooms at the Holiday Inn Express at Monterey Bay. Each warmly decorated room includes a seating area and offers pay-per-view movies. Free access to the fitness room and hot tub is offered to all guests of this hotel. The business center is available 24/7. A breakfast bar is served each morning at the Monterey Bay Holiday Inn Express, featuring a variety of hot and cold items. For more information, pricing, or to reserve your room, visit Holiday Inn Express at Monterey Bay. This property is a 20-minute walk from the beach. Offering a seasonal outdoor pool and year round hot tub, this Monterey hotel is located within 3.7 mi of the Monterey Bay Aquarium and Cannery Row. Free WiFi and a free daily hot breakfast served between 07:00 and 10:00 are included. A flat-screen cable TV, microwave, fridge and coffee machine are featured at Best Western De Anza Inn. An private bathroom with a hairdryer and free toiletries is provided. Featuring coffee, a 24-hour front desk welcomes guests to the 100% nonsmoking Monterey Best Western De Anza Inn. A koi pond is located on site. For more information, pricing, or to reserve your room, visit Best Western De Anza Inn. You are very welcome Habib. Thanks for stopping by Sand City California. _Please do come back when you are ready to start planning. It still amazes me how beautiful the shores of California are. Though I’ve never been to many of the areas you lay out here, your descriptions make them clear as day for me. Moreover, they make me want to go back there. Thank you for the information. Well done. You are so welcome Skip! I am glad you have enjoyed visiting beach travel destinations. Yes, the California coast is beautiful. One of those areas to keep going back to. I don’t think you can see it all in one visit. I really enjoed this post. Your website is very professional. It is like a one-stop website for travellers. I like that you cover pretty much everything: hotels, beaches, bars, things to do. You have done all the hard work and research and share your experience with future travellers, which is wonderful. On a different note, I have lived in Australia on and off for 5 years and your post brought sweet memories. Sand City California is a beautiful place to visit. 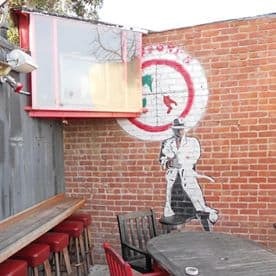 I was in California a few years ago to see my uncle that lives there, and if I knew about this place, I would have gone there for sure! But it’s never too late:) I am traveling next year to California to revisit my uncle, and this time I will not miss the opportunity to visit this place. Just a question, please if you don’t mind. My uncle lives in Los Angeles, do you know maybe the distance from Los Angeles to Sand City California by car or by bus? You are so welcome Daniella! The distance is going to be about 300 miles, or a 5 hour drive. But it will be a beautiful drive! Please let me know if you need anything else. I would be glad to help! What great scenery in the ride along the rocky shoreline. Plenty to see and do in the surrounding area too. How did that tree survive in that rock formation on the cliff? Amazing! Great video! 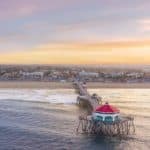 You can have a great time in Sand City, California for sure! Yes, you can have a great time! And 17-mile drive is something not to miss for sure! Ends up being an all day jaunt…stopping off and seeing all of the wonderful coastal scenery. 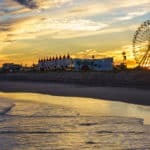 Wow what a great in depth article, I have never been to Sand City but it looks beautiful and I’d love to get out to California. When I get there I’ll know where to god for food, drinks and entertainment. Thanks for the post, really helpful. Yep, there is definitely lots to do in the area. Stay tuned as I will be writing more about the coastal community neighbors to Sand City California. Thanks for visiting Beach Travel Destinations. Thank you for helping to plan m next California trip. 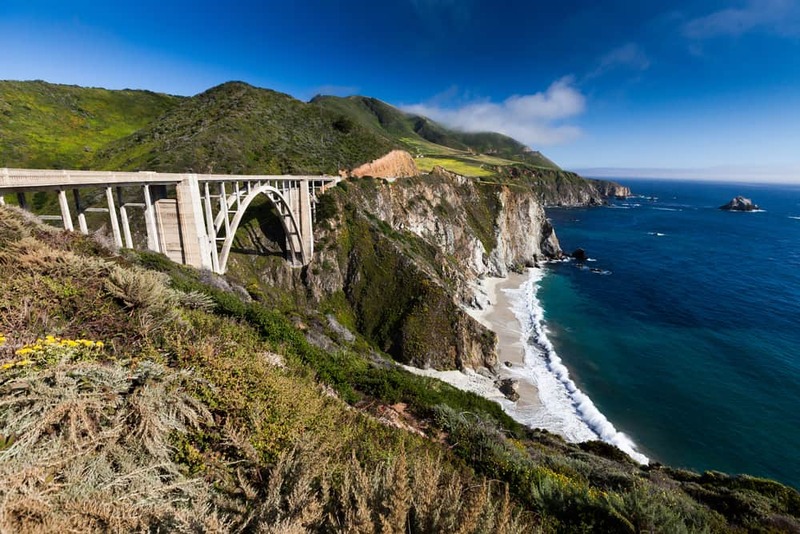 California is one of our go-to places to escape the snow and cold of winter. I have never heard of Sand City California but it looks so wonderful and April and May is perfect because of spring break. It looks up and coming with wonderful restaurants and activities and a place I think me and my family need to explore. Thanks for letting us know about this hidden gem. It is definitely a hidden gem, and also more budget friendly than some of the other larger California coastal cities. Of course, you are close enough to everything, which makes this a wonderful beach destination! I love your website and post! You are so thorough in your descriptions, weather, attractions, lodging, everything! Your website is the go-to place for anyone wanting to travel to the beach destination! Great 🙂 I am glad you enjoyed. Beaches are definitely my passion and I love going to different beaches and writing about them. Thanks for stopping by! What a beautiful site! I had never heard of Sand City before but it looks like the smaller less crowded destinations that I prefer. I’m so glad you provided such detailed information including activities, restaurants and hotels. Yes, Sand City California is a very small town nestled next to Monterey. So you kind of have everything you need, should you want to head to the big city as well. Thanks for visiting Beach Travel Destinations Kyle! Looks like a great place to visit! This is so helpful for me and my husband as we love to travel when we have the chance and our bucket list just gets bigger and bigger. Endless list! 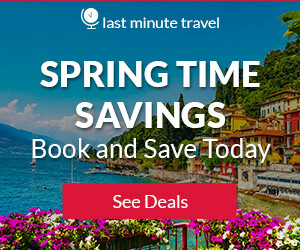 Thanks for this travel idea! I love the beach anyway so I can just stay under the sun laying on the sand and I’m all set! Yes, that is kind of how I am too. Give me a nice tropical frozen drink, and I am set! But, there is also plenty to do in the area should you want to. Thanks for reading about Sand City California. This is another great post from you. Sand City looks really beautiful with all those area attractions and things to do. Would love to go there once, just have to make sure it is April or May to have the best impressions. 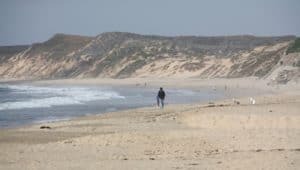 April and May is a beautiful time of year to visit Sand City California, and the area in general. Glad you enjoyed reading and learning. Thanks for stopping by! Central California is beautiful Rob, you will love it here. The coastline is just awesome, and there are so many great beaches, things to do, wonderful food, just everything. I hope you can visit Sand City California soon! And I will agree with you on Sand City. Beautiful and wonderful weather. Cannot be beat. Glad you enjoyed visiting beach travel destinations! Ahhhhh…your article just makes me want to go to the beach! Very good and informative. Love the images too! Love your whole site…so refreshing and lots of information. Saving it to favorites. Thank you Paulette and glad you enjoyed visiting beach travel destinations. Thanks for stopping by!